The future European Fisheries Control System is currently being negotiated in the European Parliament and by representatives of EU Member States. It consists of an overhaul of the Control Regulation and key amendments to a series of other relevant regulations, including those related to the European Fisheries Control Agency and illegal, unreported and unregulated (IUU) fishing, among others. Robust, harmonised and effective fisheries control measures are vital to ensure that the rules of the Common Fisheries Policy (CFP) are enforced to achieve sustainable fisheries. It is also necessary to complement existing policies against illegal fishing that the EU has adopted with its Regulation against IUU fishing. The current negotiations, therefore, present a unique opportunity to promote the development of best practices for fisheries control and rule enforcement, both within EU waters and internationally. Moreover, the EU has the opportunity to demonstrate its continued leadership in the fight against IUU fishing. On 7 March 2019, the NGOs working on the future European Fisheries Control System (Environmental Justice Foundation, Oceana, The Pew Charitable Trusts and WWF, on behalf of a wider NGO coalition including ClientEarth, The Fisheries Secretariat, Our Fish and Seas At Risk) organised an event in the European Parliament focused on how to deliver fully documented fisheries, which are effectively controlled and monitored fisheries that are transparent about their practices and whose seafood products are traceable. The event was live-streamed and the recording can be watched here. The revised system that will result from the current negotiations will impact all European fishers, fish importers, Member States’ control authorities and, ultimately, seafood consumers. To reflect this broad spectrum of stakeholders, the event brought together experts from the fishing sector (a representative from the small- scale fishermen in Andalucía and a speaker from Europêche), the European Fisheries Control Agency (EFCA) and national authorities (a representative of the French Fisheries Maritime and Aquaculture Department DPMA). The event was kindly hosted by Members of the European Parliament (MEPs) Isabelle Thomas and Ricardo Serrão Santos, together with the Intergroup on Climate Change, Biodiversity and Sustainable Development. Francesca Arena from the Directorate-General for Maritime Affairs and Fisheries (DG MARE) also presented the perspective of the European Commission. The event highlighted three key themes: better monitoring and catch declarations for the small-scale fishing fleet; higher standards for imports of fisheries products; and the effective control and monitoring of EU waters along with the importance of data and information exchange. To showcase the benefits of implementing a monitoring and control system to the small small-scale fleet, Georg Werner from EJF presented an NGO-produced video on the current system in Andalucía. The ‘green boxes’ system has been in place since 2004, when the Regional Government of Andalucía in Spain started to install this real-time monitoring system on small vessels. The video demonstrates how the monitoring and catch reporting of small- scale vessels is not only possible, but has been embraced by both control authorities and the fishers themselves, who have each recognised the benefits. The Andalusian success story demonstrates that cost-effective solutions for small-scale fishing are a reality and that they can be extended to all EU waters. 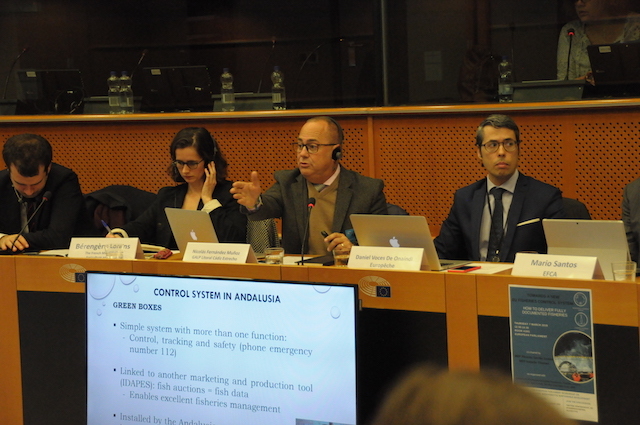 Nicolás Fernández Muñoz, president of the local fishermen organization GALP Litoral Cádiz Estrecho in Andalucía, elaborated that the implementation of the fisheries control system in Andalucía has resulted in successful fisheries management. Green boxes were installed on 97% of small-scale vessels (i.e. those under 12 metres) in the region and have been providing invaluable data on control and safety at sea, while their installation came at no cost for the fishers. Effective management by both the fishers and the authorities would be impossible without the green box system. Mr Fernández Muñoz further explained that the efforts of the local fishermen are at risk of being undermined by the activities of recreational vessels and he stressed that all vessels, commercial and recreational, should be equipped with the green box system. See Mr Fernández Muñoz’s presentation here. Daniel Voces De Onaíndi from Europêche explained that the EU relies on imports for over 60% of its total seafood consumption. He expressed that imported products should meet EU sustainability, traceability and accountability standards and that currently there are critical differences between non-EU and EU-caught products and the information they are required to provide. A unique vessel identifier, or IMO number, which can be acquired at virtually no cost from the International Maritime Organisation (IMO), is mandatory for all EU vessels above a certain size and required by many Regional Fisheries Management Organisations (RFMOs) as well. Mr Voces De Onaíndi recommended that the IMO number should be included in the catch certificate currently required for all fisheries products imported into the EU. Mr Voces De Onaíndi additionally shared that, EU vessels must provide more detailed information on the origin of their catch and the catch area than is required for imported products. He argued that including this information would ensure the traceability of EU-sold seafood throughout its entire value chain. Europêche supports the creation of an EU-wide database for catch certificates, but the European Commission should look to ensure inter-operability and a proper implementation to avoid trade shifts. Labelling standards, which currently apply to 75% of EU landings but to less than 10% of imports, also need to be amended. The scientific name in addition to the commercial name was recommended to be listed and, importantly, social standards should be included. Key data, such as the type of fishing gear, is not currently required for processed fishery products even though this is mandatory for fresh products. Without this information, consumers are not properly informed, Mr Voces De Onaíndi made clear. Mario Santos from EFCA explained that Joint Deployment Plans (JDP) have greatly contributed to facilitating the exchange of primary fisheries and control data, and provide a solid basis for risk management approaches on a regional basis. The JDPs focus on training, exchange of information, promote transparency and the exchange of inspectors. These measures all aim to improve a level playing field and compliance with rules for sustainable fishing practices. EFCA recently obtained an Operational Patrol Vessel, which helps to promote control both in and out of EU waters. On the exchange of data, Mr Santos explained that, in the JDPs, the catch data (logbook data) and geo-position data (VMS) are already combined and go beyond the data from the coastal and the flag State, thereby providing a more holistic overview of a given fishery. This method is key for transparency and meaningful risk assessment. A way forward at the EU level could be the creation of a central repository of EU data, and combining catch, geo-position and control data which be fully accessible by EFCA, Member States and the European Commission. 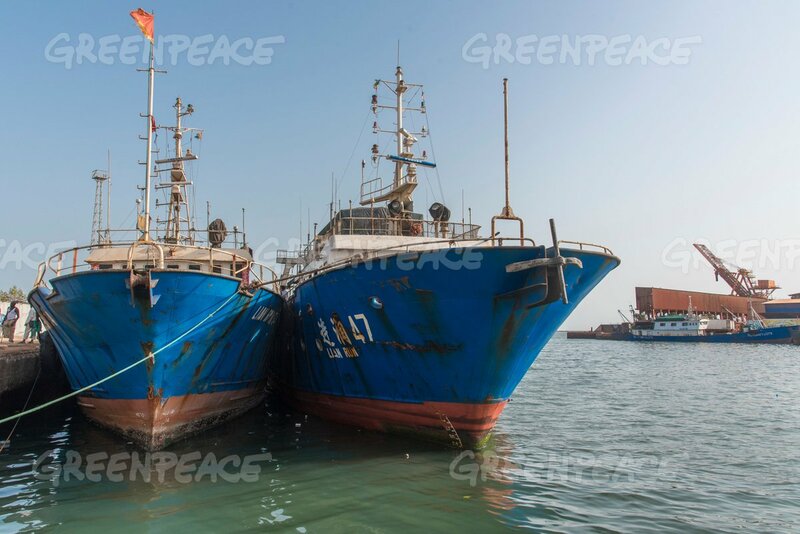 Internationally, a consistent picture of EU fishing activity is lacking. As a major fishing power, the EU should address this current shortcoming and EFCA stands ready to help. EFCA has been actively involved at the international level through JDPs in RFMOs, as well as by providing direct support to non-EU countries in the EU’s fight against IUU fishing. A prime example of this is the Improved Regional Fisheries Governance Project in West Africa (PESCAO). EFCA also provides training, mostly to Member State inspectors through JDPs, but also with non-EU countries in West Africa and around the Mediterranean Sea. On remote electronic monitoring (REM), EFCA has been working with Member States to define technical and minimum requirements, as well as guidance on how to implement such systems. A final document will be presented in April. Bérengère Lorans from the French Maritime Fisheries and Aquaculture Department stated that the French administration sees the revision of the Fisheries Control Regulation in a positive light, leading to more clarification and simplification of the Regulation. For France, she emphasised three important aspects: firstly, the importance of a harmonised control system. France, she made clear, supports the digitalisation of catch declarations for all vessels, including small-scale ones. This will require investments from control authorities and from the fishing sector, so sufficient financial support is key. Secondly, she discussed the importance of implementing a comprehensive, simplified traceability system that works across Member State borders and includes imports from third countries. France is also supportive of the creation of the EU-wide database for catch certificates, which the European Commission is in the process of developing. On certain additional control measures, such as the proposal to have continuous monitoring of vessel engine power and the requirement to have REM on high-risk vessels, Ms Lorans drew attention to the fact that France requests additional information, especially about which fleets would be impacted. Ms Lorans closed by sharing that France supports the centralisation of serious infringements and penalties within the Control Regulation. These are currently spread out across several regulations, which has caused problems regarding the uniform implementation of sanctions. In her introduction, MEP Isabelle Thomas also underlined the need for reliable data. This is one of the three main priorities of the European Parliament, together with the harmonisation of fisheries controls throughout the EU to address the current differences in fisheries sanctions between Member States, thus undermining the level playing field for the sector. 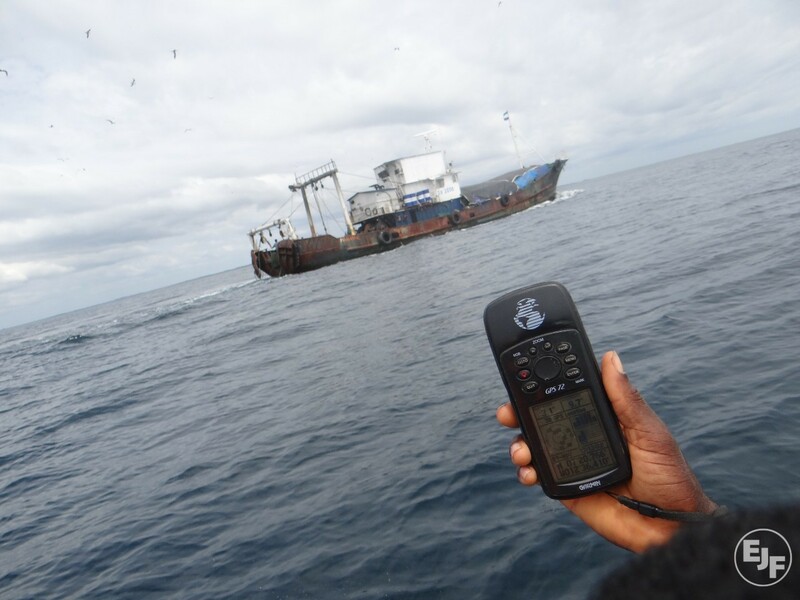 Ms Thomas also stressed that small-scale vessels should be monitored and report their catches electronically, especially to increase the quality of data available in a simple and cost-effective way. She also proposed that EFCA should play a larger and more centralised role in the collection of the fisheries data. Francesca Arena of DG MARE agreed with the three main objectives by Ms Thomas and stressed the significance of implementing harmonisation, simplification and the need for reliable data. These issues, she took care to mention, could not be seen in isolation. Harmonisation and the creation of a level playing field will help fishers accept the Control Regulation. Ms Arena mentioned the success of the Andalusian Green Box system, underlining that this was possible because the same requirements applied to the entire sector. There are a lot of cost-effective and user-friendly tools available for small-scale vessels, Ms Arena informed, and to this end a great number of projects have been put in place all over the EU. Better data from the small-scale sector was also key for traceability, according to her. Recreational fisheries need to be better controlled and more data is needed on these activities. She added that beyond what was discussed at the event, some of the tools and measures to ensure fully documented fisheries include a stricter control of engine power and that REM should be installed on vessels based on a risk-based approach. Mr Serrão Santos closed the event by saying that the digital tools available should be used to monitor small-scale vessels. He pointed out that recreational fisheries would seem to be an area which urgently needs to be addressed in the form of better monitoring and control.